The arrival of the spirit duplicating machine and later the photocopier made possible the production of limited circulation do-it-yourself publications by smaller groups and individuals. Before World War 2 this facility had been used by the Fascist party. The Western fascist was produced in duplicated form from the Fascist headquarters in Lockyer Street, Plymouth. Filled with tediously sycophantic praise for "the leader" and exhortations to hard work it ran from 1933 until its final issue, the sixteenth, appeared on 18 February 1934, when it ceased due to "inadequate support" although it intended to distribute free newssheets in the future. While Devon is not the first locality to spring to mind when militant socialism is mentioned, there were active campaigners on the left and they had their own publications. The South-West worker was established in July 1970, changing its name to the Westcountry worker the following year. From its headquarters in Kingskerswell and later in Newton Abbot it was issued in duplicated form, reporting on strikes and demonstrations in the region. A generation later much of its content appears very dated and politically incorrect with many sexist remarks. In the 1970s and 1980s there was a lively alternative press in Exeter. The Exeter flying post, which started weekly in the late 1970s with a format reminiscent of Private eye, described itself as Exeter's campaigning newspaper, but it almost became part of the establishment, compared with other photocopied news-sheets and fanzines which were much more ephemeral. Much livelier than the overtly political periodicals was the press that developed around the popular music scene in Devon. Pushing the use of scissors and paste in the make-up of pages to the extreme it presents an anarchic appearance and indeed it is no surprise to learn that at least one of the periodicals in this period was produced by an anarchist collective. Among the earliest was a magazine called Catrap and this was joined in about 1977 by a fanzine with the title Stranded. In 1977 Worthless words arrived on the scene and the previous two titles merged with it. Each issue featured different groups who had gigs in the region, for example issue 4 included John Otway, Avant Gardener and Floating Goat. In issue six the appeal for distributors, presumably in night clubs, gives a flavour of the style - the capitals are as in the original: "WANNA EARN SOME MONEY? WANNA LIFE WITH GOOD WAGES, FREE CAR, PENSION, TRANSPORT EXPENSES, FREE RECORDS, BEAUTIFUL MEN HANGING AROUND YOU, CHEAP RENTS AND NO SEXUAL PROBLEMS? Weeelll, you won't get any of these but you can sell WW for us. Good commission paid." On the same page a list of eleven outlets where the magazine could be purchased, eight in Exeter, two in Exmouth and one each in Torquay and Plymouth almost has the flavour of an eighteenth century imprint. They include newsagents such as Queen Street News (a good source for such titles at that time), bookshops such as the University Bookshop and music shops such as Bill Greenhalgh's, all in Exeter. The reader is urged: "Buy two, in case you lose one!" Below that table they announce: "We are now self sufficient in the duplicating side of our printing. This means that we can offer to print leaflets - lyric sheets - petitions -pamphlets - or anything like that - on white or different coloured paper - at cost price, for any organisation, band or campaign that we feel we share something with. Costs are about 3/4p per sheet (single or double sided) irrelevant of amount. Write to Catalyst at the address given and we will try to sort something out." In the same issue there is a survey of similar alternative publications with the introductory comment: "At the moment D.I.Y. publishing is coming very much alive in and around Exeter. We felt this local literature deserved coverage. So, leaving the national stuff until next time, here's what we found." Five titles are then briefly described: Nexus, produced by a collective in Barnstaple with regular accounts of CND activites in the region, Never surrender, a punk based fanzine produced in Bideford which "concentrates solely on music with loads of gig reviews", Obnoxius, based in Exeter and printed and partly written by the Catalyst collective and two publications by local organisations in Exeter, the Exeter CND newsletter of "interest to all peacemongers ... factual rather than informative rather than inspiring" and Exeter Women's Group newsletter. 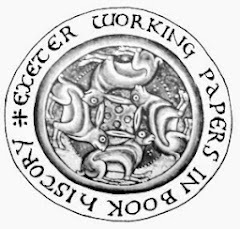 The 1990s saw an increase in the number of homeless people on the streets of Exeter, part of a nationwide phenomenon, and also a rise of a new type of hawker in the tradition of the nineteenth century ballad monger. The Big issue was established in London to give the homeless some sense of self respect by setting them up with a stock of the periodical to sell. The cover price in 1998 was £1.00 of which one third was retained by the seller. In about 1997 a regional edition was established with some local articles, for example a survey of the library service in the region. It is not to be wondered at that the content of many of these publications is unacceptable or disturbing to the establishement but on occasion more orthodox publishers could fall foul of the law; even in in the more liberal climate of the later twentieth century there are still limits to what can be published. In November 1978 Jeremy Thorpe, the MP for North Devon, was accused of conspiring with three others to murder the male model Norman Scott. The affair made national headlines and resulted in several publications, among them The Thorpe committal, by Peter Chippendale and David Leigh. For a while the sale of this volume was forbidden as the matter was still sub judice but in March 1979 it was possible to buy copies in a remainder bookshop in Exeter. Thorpe was finally acquitted of all charges at the Old Bailey in June 1979 but in the meantime more than one publication had been driven underground. These alternative publications were written and produced by young people, often at the age where their counterparts in previous centuries would still have been serving their apprenticeship. Issue six of Worthless words is dedicated to Nick Hamson, who had established the publication: "During the early days ... Nick's enthusiasm proved an inspiration (and sometimes a pain) to all concerned. Since then Nick wrote a number of articles, some good, some not so good, but his initial enthusiasm kept him going. In addition to his work for WW, he also studies full-time at Exeter College and held down the difficult job of social secretary there. On Saturday 11th March he was killed in a road accident. He was 17 years old but he'd done more in those 17 years than many people do in 70." This tribute demonstrates how the access to the published word had spread, thanks to developing technology, to virtually anyone who had the desire to get their words into print.